There actually wasn’t an awful lot ‘wrong’ with Project J’s bathroom before we started work last week, other than that the wrong paint had been used straight on top of bare plaster / board and had started to peel off in the humidity, plus the radiator needed updating. 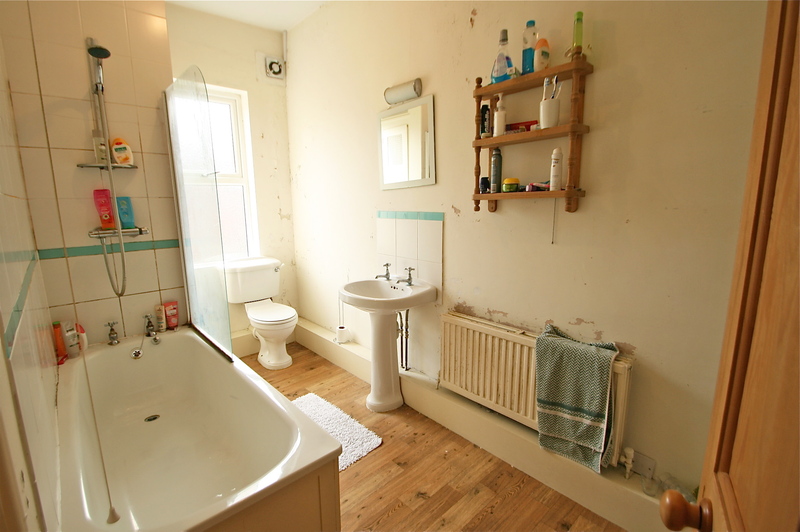 However, the clients hated their bathroom and wanted a whole new look which was more their style. Ever obliging, the Moregeous team got cracking last week on the space and the kitchen downstairs in this Didsbury terrace and soon the house was unrecognisable. 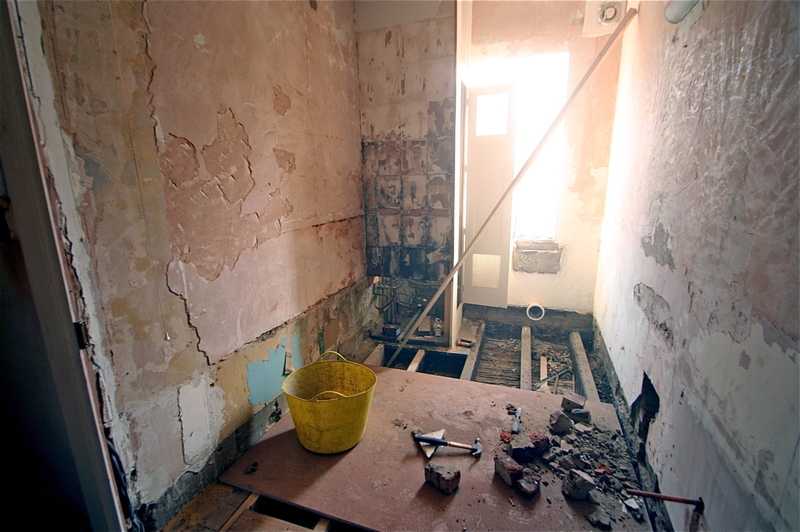 I love this stage of works, the muckiness of it all, but it’s often quite frightening for clients to see their home looking like this, for some a stiff gin is needed both before and after any visit. Luckily Mrs J has a strong constitution and was up for site meets where it’s always easier to make decisions. Stripping back a room exposes a multitude of sins and I don’t know how many times this poor room had been patched up, re-patched and partly skimmed. Not to mention the floor which sloped at an alarming angle and blackened timber behind the shower wall tiles. Time to start again with a proper job methinks! Full re-skim, re-wire, re-plumb and re-level required. Added to the mix a visit to Coach House for furniture for Project Pizza, lighting shopping and specifying for Project Tofu which starts tomorrow over in Chorlton and I am BUSHED! Sofa please, and wine would be nice…..
You’ve created my brother’s bathroom! 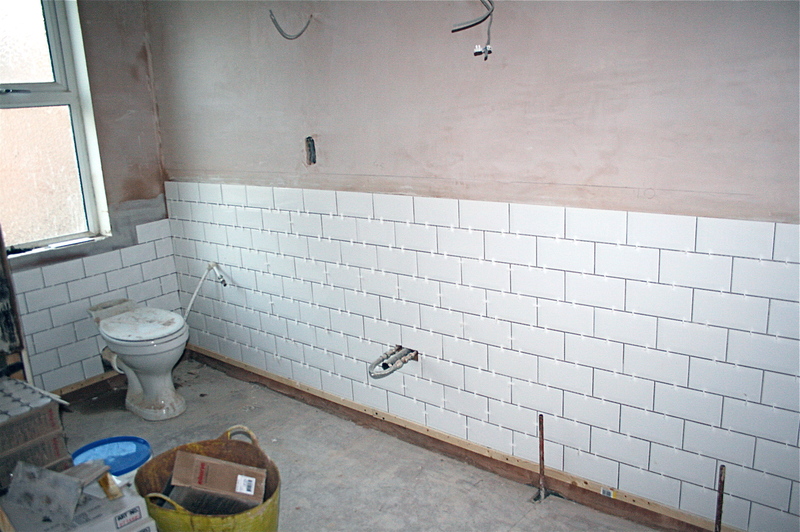 Same tiles, anyway. Look forward to seeing more (I came over from writeonmum, btw). Nice of you to drop by, let me know if it’s ALL the same at the end, that would be freaky!